Weekly meal planning in full effect this Sunday. I have already meal planned and grocery shopped. I am spending this afternoon getting organized and doing some prep to make the week easier. Seriously this theme days plan has made my life so much easier. We are still getting lots of variety and I am streamlining planning. I am hopeful that when summer comes we can do lots of grilling and make extra each night so we can cook less and eat more left overs. What are you guys having this week?? Just a thought I had. Ed Sheeran has a new song out right now called, "What do I know" If you haven't heard it yet, check it out on You Tube. It is one of those songs that just makes you think, reevaluate how you take on life. It hits close to home for me. I think so much about working out, what I am eating and feeling bad when I am having one of those days when things just don't fit the way I want them to. And when I am having those days I know it changes my attitude and my focus for the day. But positivity is the way to go. Love and understanding for others and for ourselves. Especially for our kids, for Evelyn in particular. Life is tough, full of things we don't want to do but staying positive will always make it better. Still sticking with the easy weekly themes and it has been going great. Easy to plan and we have still had lots of variety with our meals. 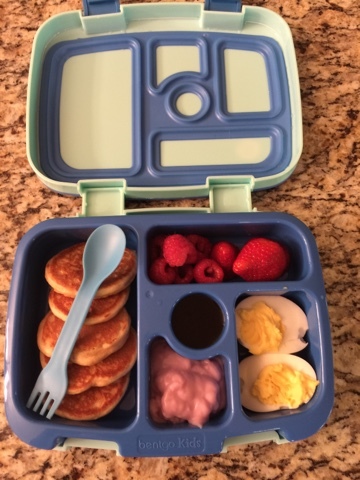 Mike is traveling this week so a few meals might be skipped and replaced by breakfast for dinner or maybe going out to eat. I grocery shopped today though so I am prepared. 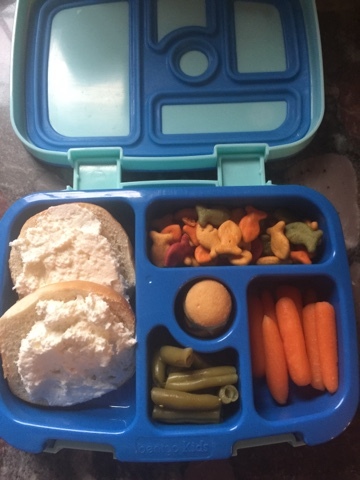 I am doing a little bit of meal prep today to make our evenings easier. The kids have started their sports and that will take up a few of our nights. So I am simplifying things and planing ahead more to hopefully help me not feel so frantic at dinner time. I am prepping egg cups for breakfast and making a batch of french toast to quickly heat up during the week with some fruit of the kids. Next weekend we are having some new friends over and I think we are going to be making some of our favorite foods from New Orleans. I'll be sure to post pictures on instagram so be sure to follow. 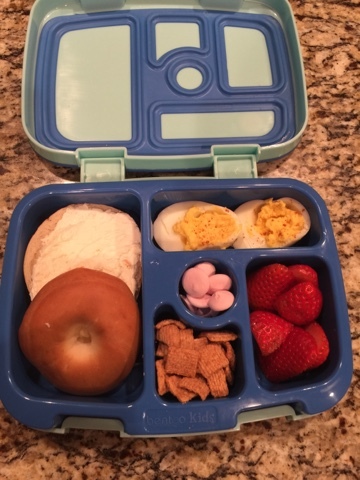 Since Evelyn was diagnosed with Type 1 diabetes I have started packing her lunches. I love it and I am happy to be knowing exactly what she is eating. And to be honest at this age and with her diabetes I have to stay on top of what she is consuming. 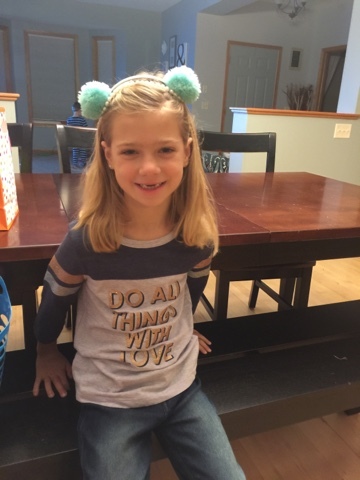 Dosing insulin based on what she is eating at the cafeteria is really not an option. It was a great purchase. It's the perfect amount of food and lets me give her different options. 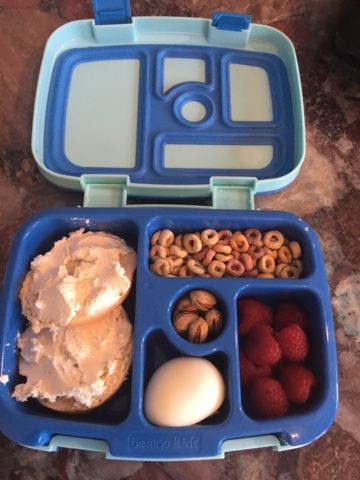 At this age Evelyn likes to do a lot of snacking so the smaller compartments allows me to give her a good variety with lots of healthy options. She is in kindergarten now and I think this box will work for the next few years if not all the way through elementary. I ended up buying the blue because that is what she wanted but I have an additional purple insert to change things up but I haven't used it yet. It is leak proof and the food stays in the compartments. 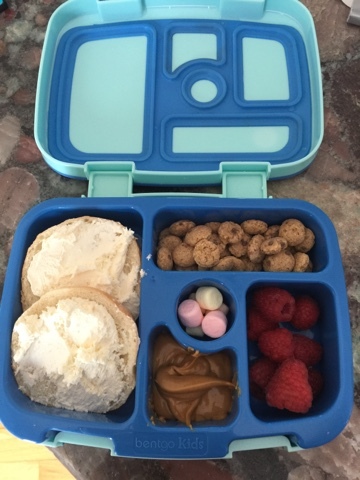 I can pack things like yogurt and hummus without worrying about them mixing with everything. 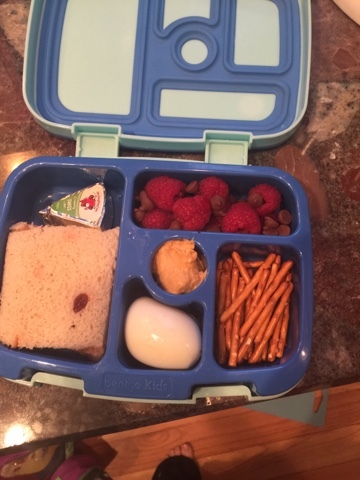 I make lunches in the morning before school or the night before depending on time. 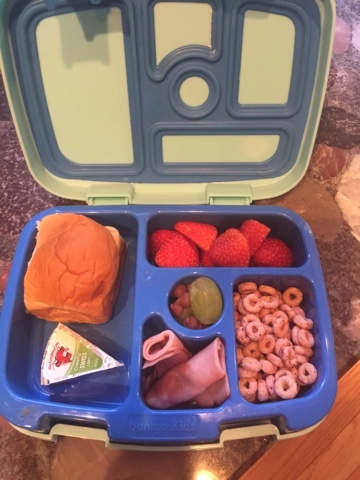 Evelyn goes to the nurse right before lunch and does a finger check for her blood glucose number and then the nurse gives her her insulin shot based on the carbs that I pack in her lunch. 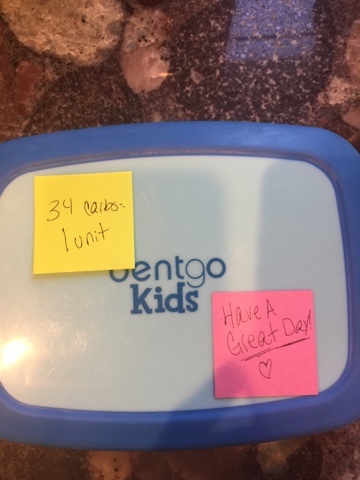 I put a sticky note on the lunch box each day. This system has been working out well for us. Evelyn would prefer to eat mostly fruits and vegetables. 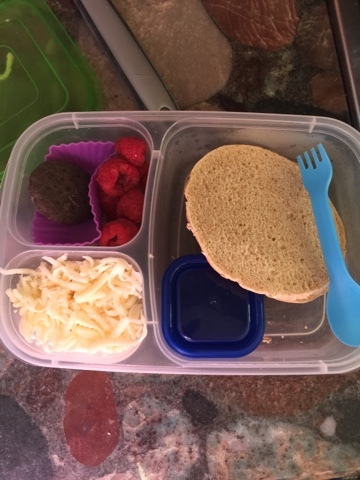 Protein and carbs are not her favorite so I try for 30 grams of carbs at each meal. Kids need carbs for energy and right now her insulin is 1 unit for 35 carbs. 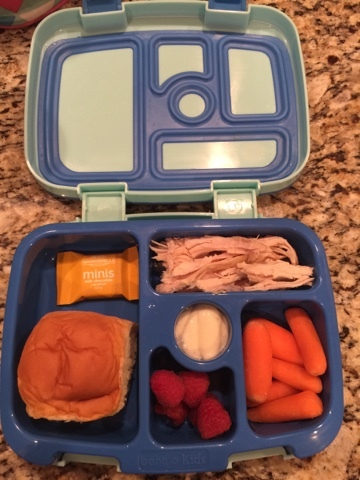 Below are some pictures of the little lunches I have packed for her. 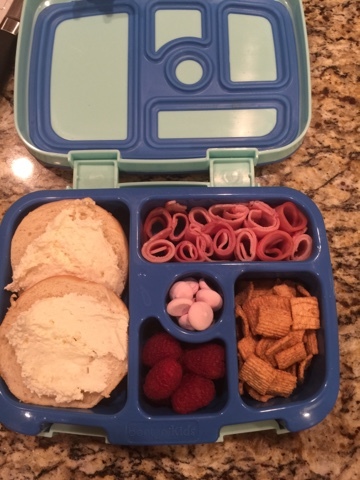 She eats of lot of the same things, like the mini bagels but she doesn't like sandwiches too much so the bagels with cream cheese are 24 carbs so it is a great option for her.